Polish rabbi; born in Cracow about 1690; died at Amsterdam April 2, 1755. He came of a famous family of rabbis. His father Saul had been rabbi of Cracow; his grandfather was Rabbi Hoeschl of Cracow. 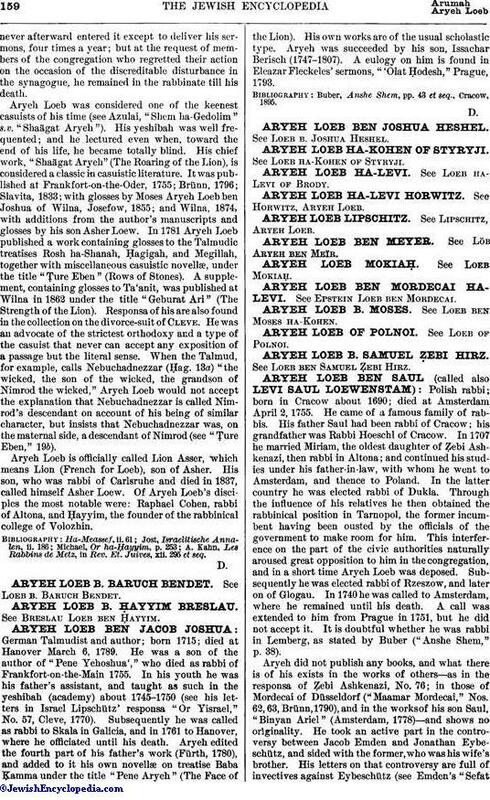 In 1707 he married Miriam, the oldest daughter of Ẓebi Ashkenazi, then rabbi in Altona; and continued his studies under his father-in-law, with whom he went to Amsterdam, and thence to Poland. In the latter country he was elected rabbi of Dukla. Through the influence of his relatives he then obtained the rabbinical position in Tarnopol, the former incumbent having been ousted by the officials of the government to make room for him. This interference on the part of the civic authorities naturally aroused great opposition to him in the congregation, and in a short time Aryeh Loeb was deposed. Subsequently he was elected rabbi of Rzeszow, and later on of Glogau. In 1740 he was called to Amsterdam, where he remained until his death. A call was extended to him from Prague in 1751, but he did not accept it. It is doubtful whether he was rabbi in Lemberg, as stated by Buber ("Anshe Shem," p. 38). Aryeh did not publish any books, and what there is of his exists in the works of others—as in the responsa of Ẓebi Ashkenazi, No. 76; in those of Mordecai of Düsseldorf ("Maamar Mordecai," Nos. 62, 63, Brünn, 1790), and in the works of his son Saul, "Binyan Ariel" (Amsterdam, 1778)—and shows no originality. He took an active part in the controversy between Jacob Emden and Jonathan Eybeschütz, and sided with the former, who was his wife's brother. His letters on that controversy are full of invectives against Eybeschütz (see Emden's "SefatEmet," p. 16, Lemberg, 1877). 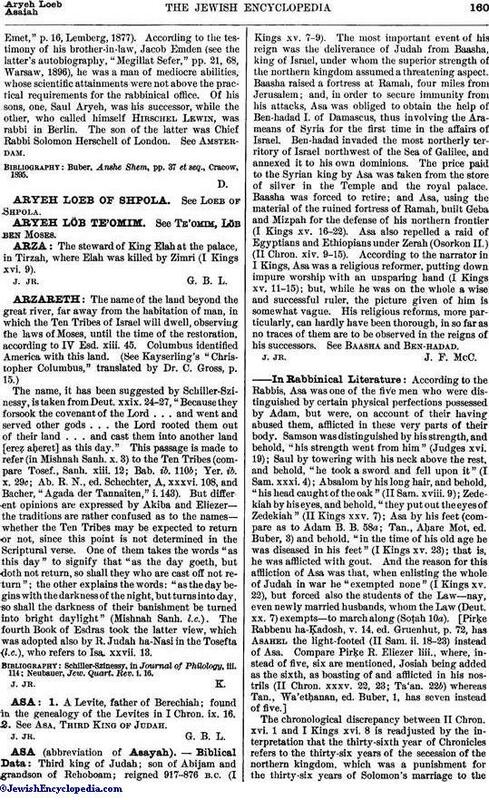 According to the testimony of his brother-in-law, Jacob Emden (see the latter's autobiography, "Megillat Sefer," pp. 21, 68, Warsaw, 1896), he was a man of mediocre abilities, whose scientific attainments were not above the practical requirements for the rabbinical office. Of his sons, one, Saul Aryeh, was his successor, while the other, who called himself Hirschel Lewin, was rabbi in Berlin. The son of the latter was Chief Rabbi Solomon Herschell of London. See Amsterdam. Buber, Anshe Shem, pp. 37 et seq., Cracow, 1895.